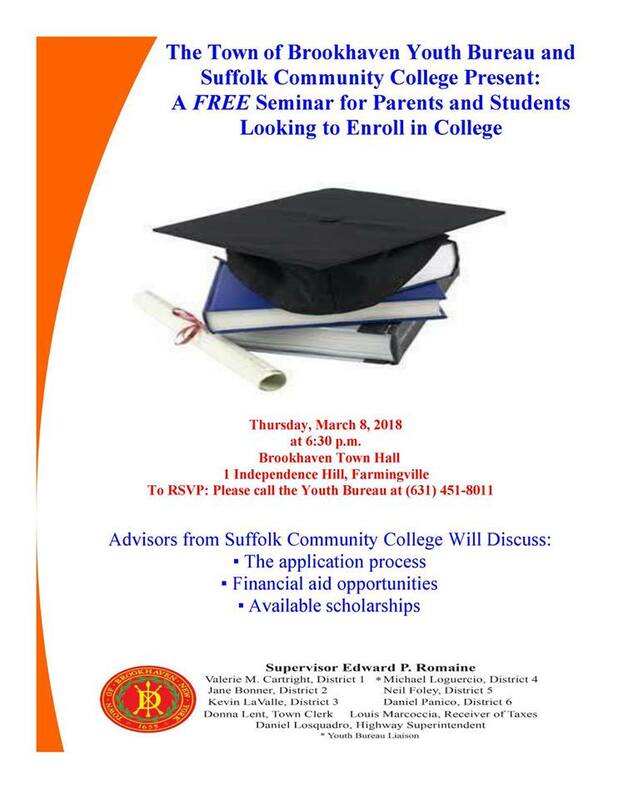 Farmingville, NY – On March 8, the Brookhaven Youth Bureau and Suffolk Community College will host a free seminar for parents and students who are interested in enrolling in college. Representatives from Suffolk Community College will discuss the college application process, financial aid opportunities, scholarship opportunities and the various programs and services the college offers to students. Much of the information provided can be used toward the overall college application process. The event will be held at 6:30 p.m. at Brookhaven Town Hall, located at 1 Independence Hill in Farmingville. The seminar will last approximately an hour and a half. Each presenter will speak for approximately a half hour, and then take ten to fifteen minutes after their presentations to answer questions. Participants are asked to register in advance with the Youth Bureau by Thursday, March 1 by calling 631-451-8011. Posted on January 23, 2018, in Events and tagged Admissions, Brookhaven, Community, Free, Long Island, State University of New York, Students, Suffolk County Community College. Bookmark the permalink. Leave a comment.